Judy had decided not to eat lunch with Sam and the preppies because she was still peeve that Michelle said she wasn’t smart, so she told Sam that she was leaving school early and going back to the chapel and he was to meet her in front of the school at 3 PM so she could give him a ride back to the chapel. Sam approached Clayton, Michelle, and three other students all seated around a table in the right corner of the cafeteria. “Hey Tom, sit here,” Clayton said motioning Sam forward and pointing to an empty seat beside him.” Everyone this is Tom Hamilton. Tom this is Kristi, Aaron, and Jarrod. I believe you already met my girlfriend Michelle. “The English scholar,” Michelle bragged. “I wouldn’t know if I’d say that, Sam said modestly. “Tom here is going to MIT after graduation aren‘t you Tom?” Clayton said slapping Sam on the back. “What will you study there?” Jarrod asked. “That sounds fascinating,” said Kristi who was looking at Sam totally mesmerized. Sam shifted uncomfortably in his seat the thought of a 17 year old looking at a 30 something man like that sent chills up his spine of course she was seeing a 21 year old Tom Hanson who looked 17 but it still gave him the creeps. If only she knew what the real Tom Hanson did for a living. “What did you get on your SATS?” Aaron asked Sam. “Whoa a perfect score? You must really be a genius,” Clayton said in amazement. “Dude that is awesome,” said Aaron. “Well that’s very ambitious,” Said Michelle. “So did any of you know the girls that were attacked?” Sam said changing the subject. “Tracy, Melissa and Alison were my best friends,” said Michelle the tears welling up in her eyes. “I can’t believe someone would have hurt them like that. Poor Alison, after she got out of the hospital she transferred to a private school and I never see her anymore. Melissa is out of the hospital but her parents have decide dot home school her and Tracy is still in the hospital in a coma. I… I….” Michelle choked “I can’t talk about it,” Michelle cried and buried her head in Clayton’s chest he held her and comforted her. “I’m sorry I didn’t mean to upset you,” Sam said apologetically. “It’s ok man, you didn’t know,” said Clayton. “And the other 2?” Sam pressed on. “Jessica and Tammy Evans the twins. No they didn’t eat with us or hang out with us. They usually keep to themselves. They spent their lunch hour in the library studying or doing their homework. Now they were geeks,” Said Kristi. She would have normally laughed about this but given the current events and subject of discussion she just hung her head. “Your dad hits your sister?” Sam asked Clayton in astonishment. Sam’s heart went out to Clayton and his sister. Something about Clayton’s story struck a nerve in Sam. He couldn’t put his finger on it but it was eating away at his very soul. “What’s the matter Sam you don’t look so hot,” said Al emerging from the door that appeared out of thin air. “If you’ll excuse me I have to use the restroom,” said Sam getting up and excusing himself. “Walk with me,” he said motioning Al to follow him. Al and Sam found the nearest boys restroom and entered. “Well yes and no,” Said Al. “Ok ok give me the bad news first,” Sam said afraid to hear Al’s answer. “Because that means anyone could still be a suspect. I still don’t know what direction to look. Ok so we know its not any of those preps but it still could be anyone,” sighed Sam. “Really how did Ziggy figure that out?” asked Sam. “Oh boy back to square one,” Sighed Sam. “I’m sorry Sam,” Al said apologetically. “No it’s fine Sam. Well I got to go,” Said Al quickly. He left through his door so fast Sam’s head almost spun. Al was hiding something and before this leap was over Sam was going to find out what it was. Back in the year 2000 officer Tom Hanson thought he was dreaming. The last thing he remembeww was being at the annual Bowlerama Bowling Tourney and he was in the middle of bowling an almost perfect game. He didn’t remember going to bed so he couldn’t have been dreaming. Then where in the world was he? All he could see was a bright light doorway and a crazily dressed man popping in and out of it Was he dead? How would he have gotten killed in a bowling alley? Had the bowling alley been held up? Had his cop instincts gotten him shot? “Oh good you’re awake,” Al said to Tom as he popped out of the bright light doorway Tom saw him popping in and out of. “Ah no, although some people would think I am,” said Al. Tom looked around the waiting room and nodded everyone in it to acknowledge their presence. Then he looked up at the ceiling and yelled, “Ok guys the gig is up. These people you got roped into this look great, but come on what is up? It isn’t even April Fools day. Come on Penhall show yourself already. I surrender you truly are the prank master,” Tom said waiting for Penhall to pop out of nowhere and reveal himself as the prankster behind this elaborate hoax. “Penhall is not there Tom. 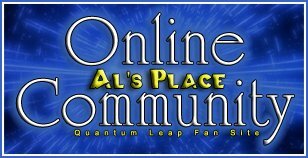 He is back in the year 1990 and you are in the year 2000 you have switched places in time with Dr Sam Beckett,” Al explained to Tom. Tom caught a glimpse of himself in a mirror on a near by wall, but the reflection staring back at him was not his own. “What the hell? Who is that?” demanded Tom. “Oh that makes sense,” laughed Tom who then fainted. About a minuet later Tom suddenly sat up and grabbed Al’s arm. “He’s changing history this Sam guy is?” Tom asked anxiously. Al stared at Tom for a second. A light went off in Al’s head. He had a feeling he new who was attacking the girls at Jackson High and who was behind Judy getting seriously injured. He just couldn’t figure out the connection between an adult who is dating a cop and teenage girls. Al looked over at Tom Hanson who had fainted again. Al pressed some buttons on his hand link and disappeared through the door to tell Sam his hot new lead. Last edited by SammieJoBeckett; 05-23-2006 at 02:45 AM.